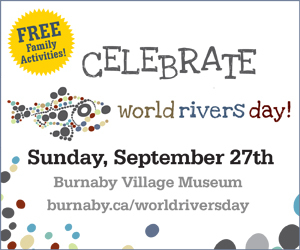 Burnaby Village Museum is throwing a free, fun family party on September 27th to celebrate the 11th Annual World Rivers Day and the 35th annual BC Rivers Day. Over 20 environmental groups and societies plus entertainers will be on-site this year with displays, demonstrations and fun activities. Ventriloquist Kellie Haines starts off the entertainment at 11:15am and kids’ performer Will Stroet & His Backyard Band start their upbeat brand of funky folk-rock sounds at 11:45am. Stay for lunch! New, this year is a wild salmon barbecue for $12.95. “Bring your boots” to join an Evergreen BC invasive species pull and streamside planting demonstration on Deer Lake Brook or to join them for a Water Quality Sampling session. The Britannia Creek Clean Up are hosting water cleaning demonstrations and the S.F.U.-Science ALIVE Program activities including making different styles of spider-webs and ecosystem energy circuits. Visitors are encouraged to take a stroll through the Village and into Burnaby’s past pausing on the bridge over Deer Lake Brook to enjoy the ecologically significant stream that runs through the village site. World Rivers Day, created by Burnaby resident and internationally renowned conservationist Mark Angelo, is celebrated by millions of people around the globe. In 1993, the City of Burnaby was the first municipality in BC to proclaim BC Rivers Day. 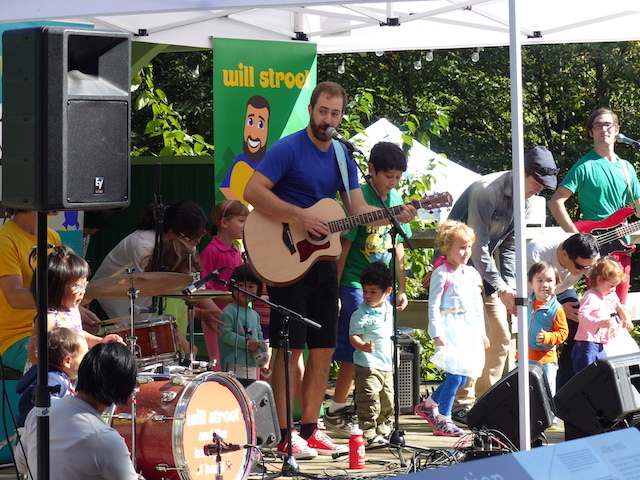 Will Stroet and his Backyard Band have developed a large family-based following. The funky high energy shows get all ages singing and clapping along. Rene Hugo is known for his lively Peruvian music. His performances on the mandolin and guitar have won several awards and are sure to entertain. Squidy aka Cal Amari Promo: This fishy ukulele-playing silt-walker stands out in a crowd. His music, songs and antics amuse all. Ventriloquist Kellie Haines is a multi-talented entertainer who delights and amazes audiences of all ages with her lively and interactive performances. The Trollsons is a comedic family of Trolls from the Canadian forest. They chat, tell jokes, sing songs, dance, play music (with accordion, drum and bells), match-make, and generally cause mischief and merriment. The Nylon Zoo offers a choreographed participatory event— kids become the dancers and performers! Fly like a bird, hop as a frog or rabbit, twirl in a rainbow cape, swim like a fish. It’s an interactive story event as children and parents enter a giant, inflatable storytelling theatre. Eco-sculpture is a modern form of horticulture also known as “topiary.” Rather than relying on stone and chisel, eco-sculptors create art from nature. 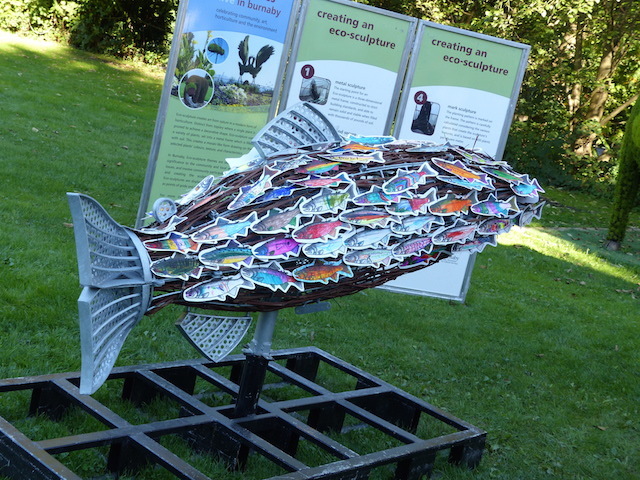 Recognizing a unique opportunity, the City of Burnaby is taking the lead in bringing eco-sculpture to the West Coast through installations and workshops. Fish-shaped creations are the focus of the day. Britannia Creek Clean Up: Information on removal and cleanup of the Tunnel Dam plus a cut-away LEGO-model of the area. Burnaby Village Museum: Step into the Tram Barn for a children’s fishy craft. Byrne Creek Streamkeepers: These volunteers monitor the health of Byrne Creek that drains a large urban watershed along the south slope of Burnaby. It runs through a beautiful ravine park and spawning habitat, and into the Fraser River. Streamkeepers help maintain the creek through community projects and public education, and monitor its rejuvenated populations of coho salmon, chum salmon and cutthroat trout. Burnaby Lake Park Association: The Burnaby Lake Park Association (BLPA) is dedicated to preserving, protecting and enhancing the Park’s natural environment, while advocating respect, appreciation and enjoyment of the park’s natural attributes and recreational resources. This regional park, right in the heart of Burnaby, is a place to reconnect with the natural world without leaving the city. The area is a stunning wildlife sanctuary where birdwatchers regularly spot great blue herons, bald eagles, belted kingfishers, osprey and even rarer birds such as the small green-backed heron. City of Burnaby: Meet staff from the City’s Engineering, Planning and Parks departments and learn more about local streams and rivers in Burnaby, the city’s recycling and water conservation programs and invasive species management programs. Coastal Painted Turtle Group: Conducting recovery activities and engaging in stewardship for the Endangered Western Painted Turtle on the South Coast of BC. They will be on site with a display of live baby turtle hatchlings. This group has recently undertaken an enhancement project on Deer Lake Brook, which flows through the museum grounds. Evergreen BC is a national not-for-profit organization that is committed to inspire positive change to restore the natural health of communities. Bring your boots to join a invasive species pull and streamside planting demonstration on Deer Lake Brook or to take part in a Water Quality Sampling session. Metro Vancouver Tap Water Team: Information on the region’s Tap Water plus the water wagon. Bring your personal water bottles to re-fill here! North Shore Black Bear Society: The aim of the North Shore Black Bear Society is to reduce human-bear encounters through education, cooperation, and community support. Reptile Rescue, Adoption and Education Society: This volunteer run non-profit group offers a care home for reptiles and amphibians. Stop by their live reptile display and learn about reptiles as pets. Stanley Park Ecological Society: Co-Existing with Coyotes is a Stanley Park Ecological Society program that aims to reduce conflict between people, pets and coyotes. The program, established in 2001, in cooperation with the Vancouver Park Board and BC’s Ministry of Environment, is the longest standing coyote co-existence program in North America, and continues to grow and serve people, pets, and coyotes through public and school presentations, park signage, brochures and an information phone line answered seven days a week. Stoney Creek Environment Committee: This stream-keeper group consists of members and interested parties. They monitor conditions in and around Stoney Creek, a salmon-spawning creek that rises on Burnaby Mountain and flows into the Brunette River. Keeping the habitat clean and healthy for the young fish is a major part of their focus, and involves counting spawning salmon, juvenile fish surveys, removing invasive plants, tree-planting, and public education. An annual meeting is held in conjunction with other Burnaby stream-keeper groups to compare notes and share results. Volunteer Burnaby: For the past 40 years, Volunteer Burnaby has been enriching lives and building community through volunteering. Stop by their tent for face-painting. Since you’ll be enjoying a full day of activities be sure to fuel up with the wild salmon barbecue with rice, green beans and lemonade. There will also be hot dogs, fish & chips, macaroni, and sweet treats like pastries, cakes and ice cream for purchase. For more information about World Rivers Day at Burnaby Village Museum, follow the museum on Facebook and Twitter and find a full schedule of the day’s events here.